But what about faceoffs overall relationship with possession? I recently have done some univariate analysis here on Hockey-Graphs, so I thought I would continue that here to get us started. I gathered all teams for every 82 game season since the 2007-08 season, the season where we first gathered shot attempt data. We see a predominately normal shape with a slight skew, and the statistics (coloured in red) confirm that the data is indeed normal shaped. 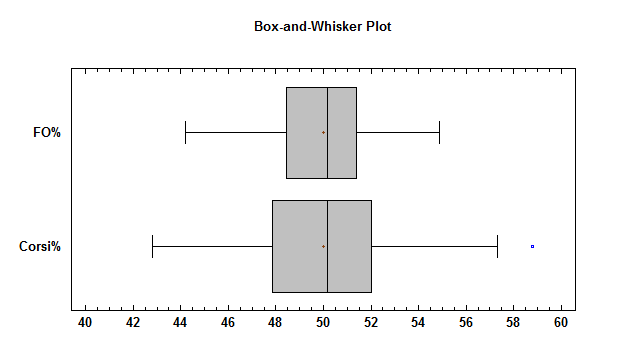 The distribution seems even more normal shaped than faceoff percentage, and the numbers seem to indicate the same. The distribution is wider, as confirmed by a much larger standard of deviation and coefficient of variation. Nothing new here except now we can visually understand the differences between the two distributions. Now all this is interesting, but what about the relationship between the two. We know there is likely a relationship through intuition and also Desjardins study on the impact of faceoffs (which helps display the causality of faceoffs in possession). There is enough statistical evidence here that we can dismiss the notion the two are not correlated (null hypothesis) and so from this information we would conclude there is a significant relationship between the two. There are still many who perform well in the faceoff department yet are outpossessed and vice versa. The largest outlier were the 2007-08 Atlanta Thrashers, who had a 5v5 faceoff percentage of 51.2 but a 5v5 Corsi percentage of 42.9. The R-squared value indicates that a team’s faceoff percentage explains about twenty percent of the team’s Corsi percentage. At first, I was a bit taken aback with the R-squared value. It seemed a lot higher than I had anticipated. There is the caveat though that correlation does not equate to causation. There are a few reasons why the impact may not be as high as the numbers indicate. For one, a faceoff battle is simply a set-play puck battle; skaters who perform well in faceoffs can also help their team’s possession by performing well in other puck battle situations. 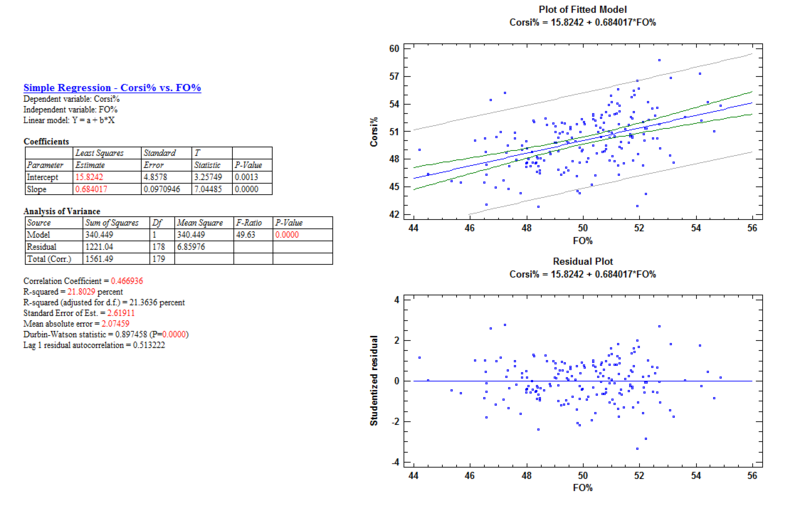 The correlation with puck possession could be picking up both impacts. Secondly, most coaches know their team’s strengths and weaknesses. They know which centres are the better faceoff options. They also know if their team performs relatively better in breakouts, sustaining pressure in the offensive zone, and neutral zone performance. 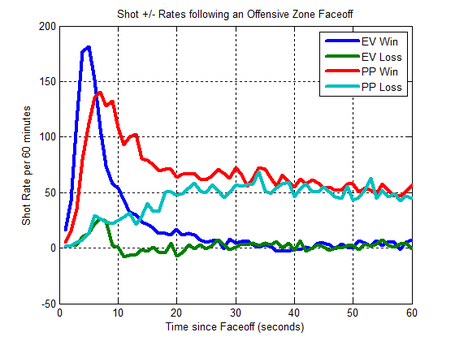 A coach may improve the impact of their faceoff percentage on their Corsi percentage by taking these into account and also by deploying their faceoff specialists predominately in non-neutral zone situations. The next step would be looking into individuals, both by this method and Desjardins method (which I did a bit here with the Winnipeg Jets centres last summer).